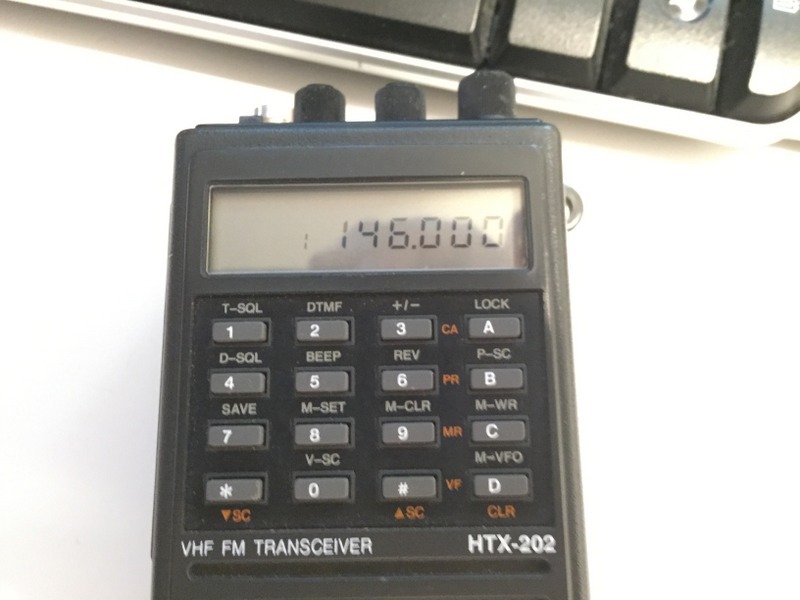 The HTX-202 is a simple 2m handheld transceiver that Radio Shack produced in the early 90s. Frequencies as well as their offset and tones can be stored 16 different banks. This unit was made prior to the prevalence of non-volatile storage, so the designers of this radio chose to maintain power to the RAM with the ever popular CR2032, a small 3v lithium ion coin cell often used as a clock battery in computers. According to the user manual, this battery is rated to last three to five years. In the case of my unit, the battery lasted over 11 years - which is fairly impressive. Unfortunately, the RAM in the radio cannot be backed by the radio's main power source for some reason. When it dies the radio must be reprogrammed each time it is powered on, which is a considerably nuisance. Thankfully, however, replacing this battery is not particularly difficult. It is also possible to add in a battery holder to make it easier to replace the cell in the future, should the radio last another 11 years. 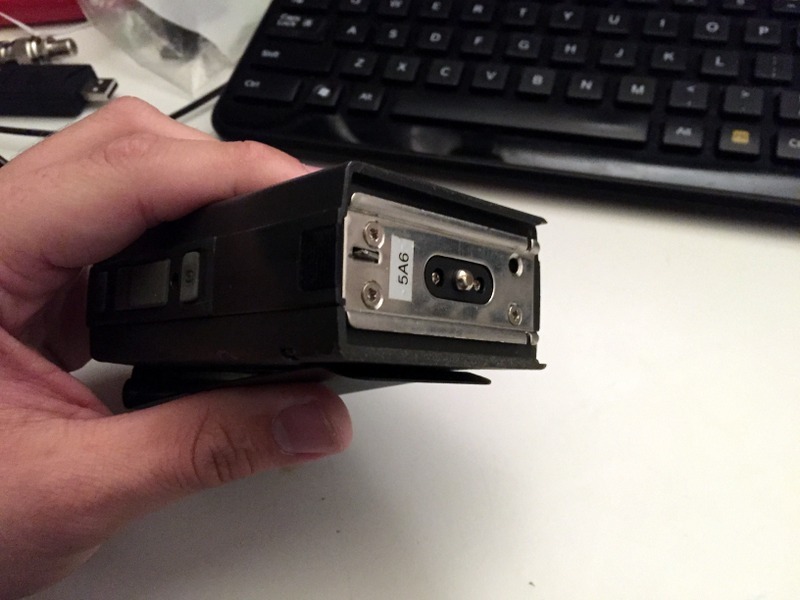 1: Remove the main battery and antenna. 2: Unscrew the belt clip and set it aside. 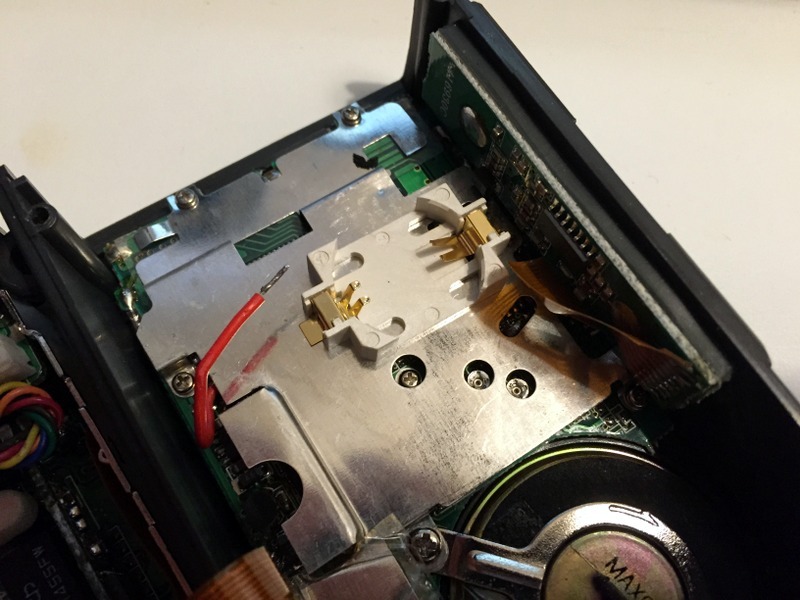 Remove the four silver screws from the bottom of the radio and remove the metal base plate. 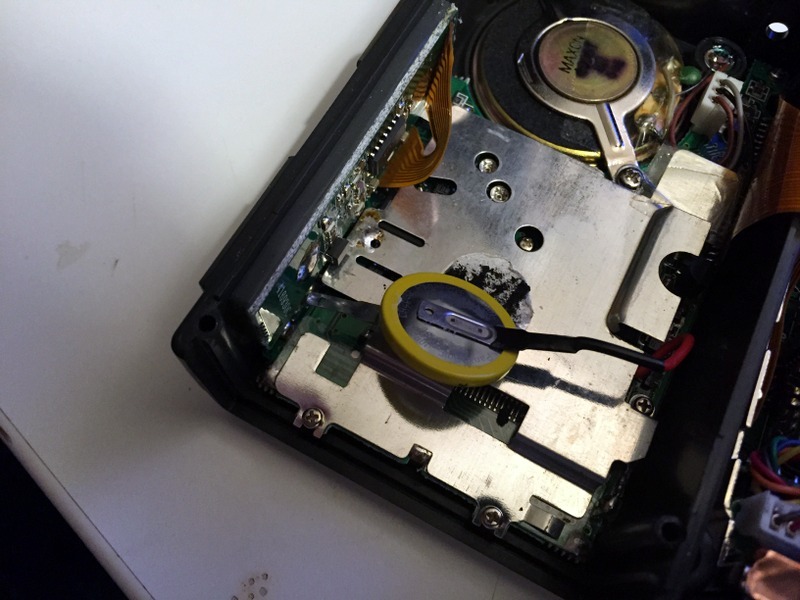 Next remove the spring steel battery latch as well as the plastic tab used to move it. Pay close attention to how it was assembled. 3: Remove the five small screws from the back case. The screws are fairly soft metal and may strip easily if you're not careful. The four screws in the corners are identical whereas the one screw in the center is much shorter. 4: Carefully lift the back panel from the radio. It may be firmly attached and require some force. Pull it straight up only. Nothing will be attached to it. The exposed board is the back of the RF PCB. 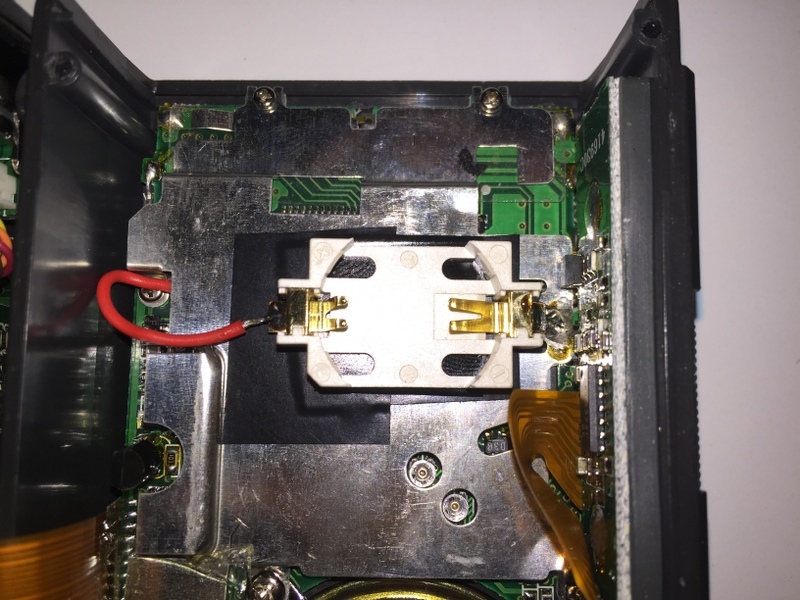 5: With the top of the radio facing away from you, place your index or middle finger on the tip of the BNC connector and your thumb at the base of the board. While keeping the rest of the radio planted, slowly swing up the RF PCB about 2cm. The battery terminal at the base of the board will prevent it from being lifted straight up, so the board will then need to be moved forward about 1cm in order to clear the bottom case. You can now swing the RF PCB up and to the left to have it lay directly beside the main case. Note that the flat flex cable attaching these two parts is not socketed or detachable and extreme caution must be taken when working around it. The backup battery can be seen at the top right of the housing. 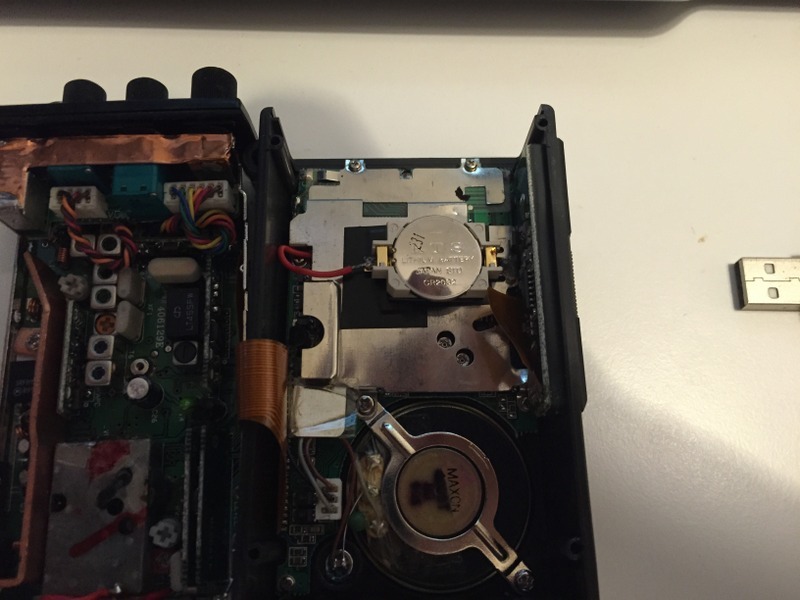 6: Locate the ground terminal of the backup battery attached to the shield on the CPU board. Carefully use your soldering iron to heat this junction just enough to remove it - if it can't be done in 4-5 seconds your iron is hot hot enough. You do not want to risk damaging the CPU board with too much heat. 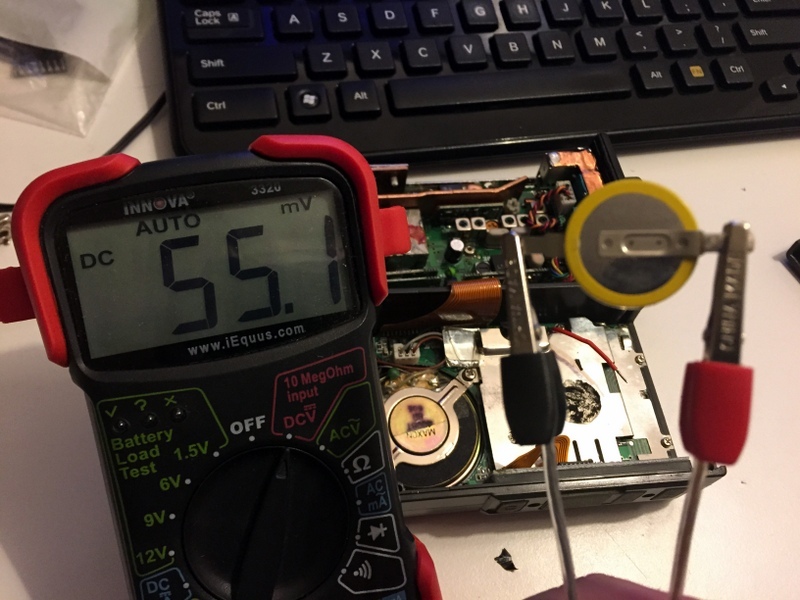 When the solder is fluid enough the battery may be removed from the shield. Note: there may be double sided adhesive foam holding the battery to the shield, so this may require some force. 7: With your knife, carefully cut the black heat shrink plastic off of the positive terminal. 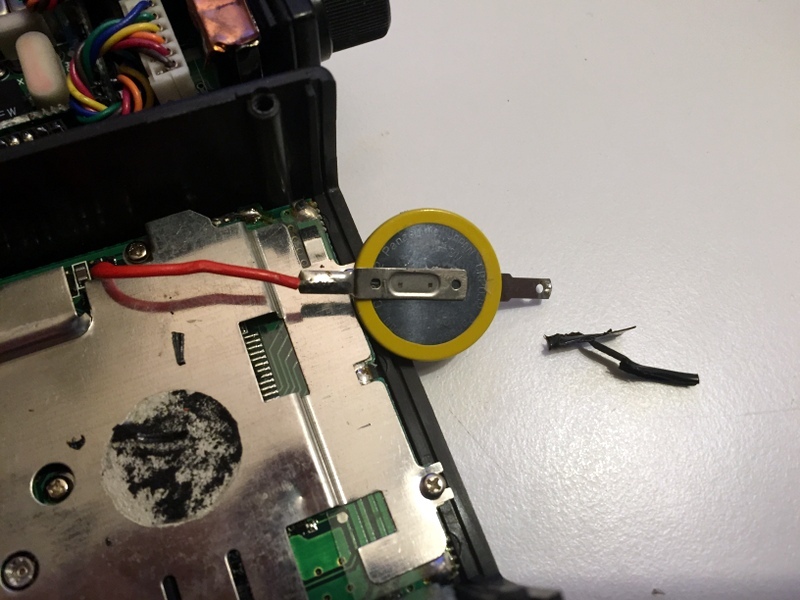 You can then desolder the wire from the positive terminal of the battery and it will be fully removed. At 55mV this cell is totally dead. 8: At this point you may want to remove residual adhesive from the foam tape that secured the battery. I find careful scraping and a small amount of goo gone to work very well. At this point I could also do a test run of the battery holder's position to make sure it would fit in the area well. 9: You'll now want to place a strip of electrical tape over the metal shielding to prevent accidental shorting. 10: Solder the positive lead to the positive end of the holder. My holder had positive and negative terminals marked - make sure to get it right! 11: Now solder the negative terminal to the small blob of solder that was left when the original battery was removed. I found that there was enough solder left for a good connection. It's a tight space but it's manageable! 12: Install the battery! I chose to also put a piece of electrical tape over the cell for extra insulation. 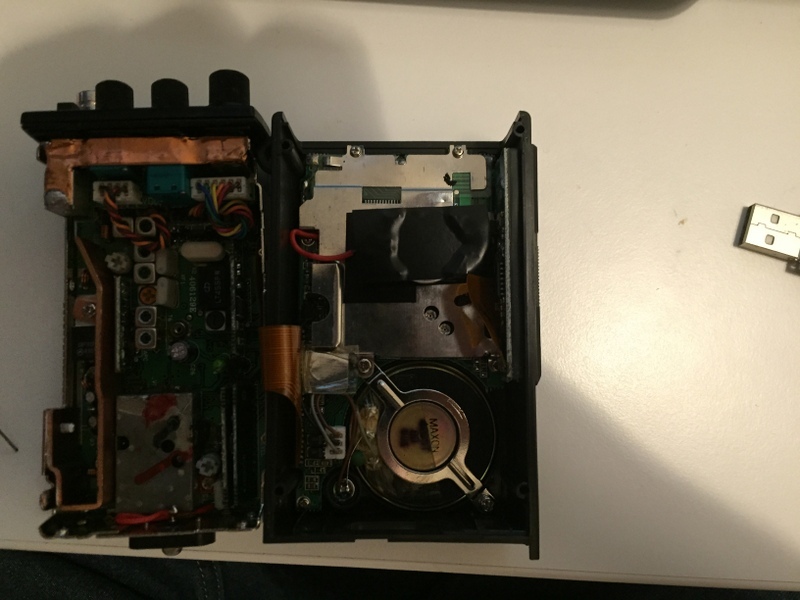 13: Reassemble your radio. The first time you power it on you will get an Err1 - this is to be expected. The battery only gave power to the RAM, it didn't provide it with data. If you hold function + D when booting the radio the first time the RAM will be set with the proper values and channels can now be saved and stored.